This research is the first to study men and women in business roles in technology-intensive industries such as high tech and telecommunications, oil and gas, and automotive manufacturing. It shines a light on the male-dominated culture of STEM companies as a whole and provides specific steps organizations can take to better attract and retain talented women across both its tech and business sectors. 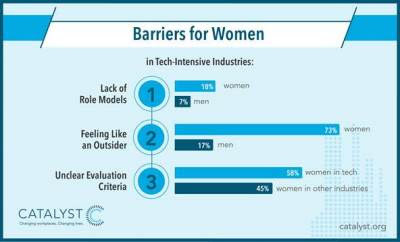 “STEM companies face a serious talent drain as women take their skills elsewhere, but these organizations also have a remarkable opportunity to turn things around by focusing on how they can make all their talent—men and women alike—feel equally valued,” says Deborah Gillis, President and CEO, Catalyst.